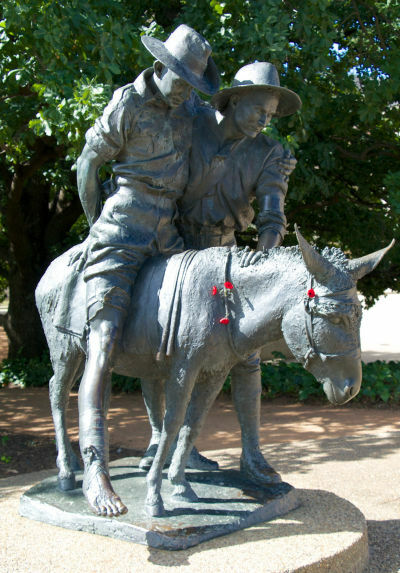 The story of Simpson and his donkey is an extraordinary tale of courage in the face of extreme danger, of an ordinary "bloke" doing what he could at immense risk to his own life. There are arguments about how much the story has been embellished over the years, but nevertheless the simple heroism of John Simpson has come to symbolise the "Aussie" spirit and made him a household name. 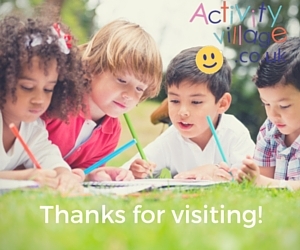 Scroll down to learn more and to enjoy our colouring page and printable activities. John Simpson Kirkpatrick was born in England in 1892, of Scottish parents. As a boy he worked in the summer holidays with the donkeys on the beach at South Shields, where he was born and went to school. As a young lad he joined the Merchant Navy and sailed to Australia, where he promptly deserted. For the next few years he worked his way around Australia as a cane cutter and coal miner as well as working on coastal ships. In 1914, apparently hoping to get a free ride home to England in time for Christmas, he volunteered for the Australian army as a field ambulance stretcher bearer, dropping the Kirkpatrick from his name and calling himself John Simpson. Simpson was sent to Egypt for training along with the other ANZAC troops, and landed at Anzac Cove on 25th April. According to legend, on the very next day, while carrying a wounded man to safety, he spotted a donkey and, immediately realising its potential, put it straight to work. 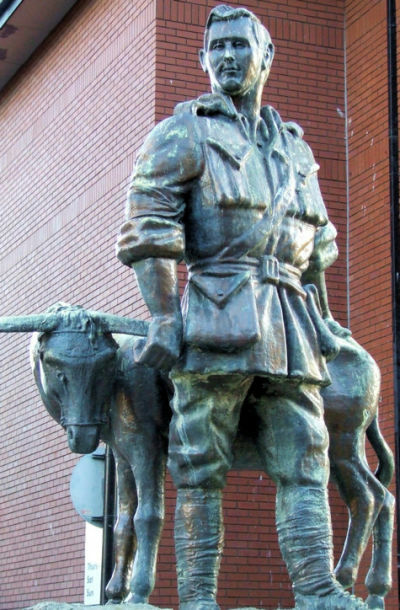 This young man and his donkey then worked relentlessly in the most dangerous conditions for the next three and a half weeks, rescuing over 300 soldiers, before Simpson was fatally shot on 19th May. He died aged just 22 years old. General John Monash, under whom he served, said this of him: "Private Simpson and his little beast earned the admiration of everyone at the upper end of the valley. They worked all day and night throughout the whole period since the landing, and the help rendered to the wounded was invaluable. Simpson knew no fear and moved unconcernedly amid shrapnel and rifle fire, steadily carrying out his self-imposed task day by day, and he frequently earned the applause of the personnel for his many fearless rescues of wounded men from areas subject to rifle and shrapnel fire." John Simpson Kirkpatrick became a hero of Gallipoli and is remembered with affection and admiration in Australia for saving many soldiers at great risk to his own life. 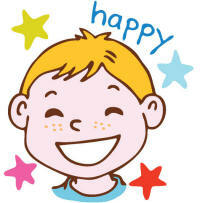 This worksheet asks children to find out some facts about him and fill in the details. 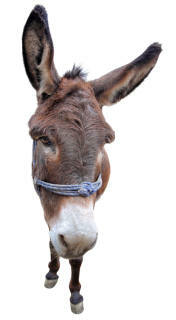 Use this writing page with the kids when you have learned about Simpson and his donkey, to take notes or perhaps to write the story of John Simpson Kirkpatrick in your own words. 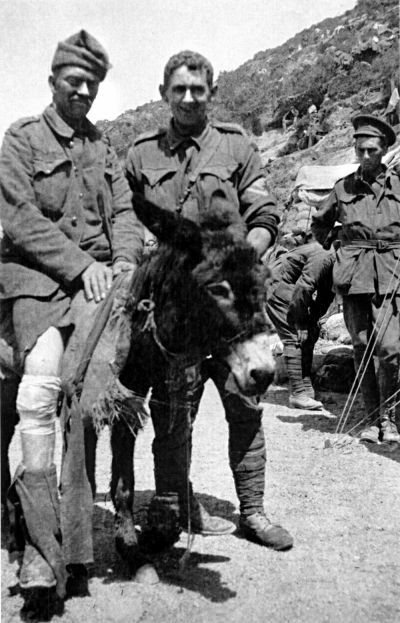 This colouring page shows popular Aussie hero John Simpson Kirkpatrick - better known as Jack Simpson - and his donkey, helping a wounded soldier to safety during the fighting at Gallipoli. 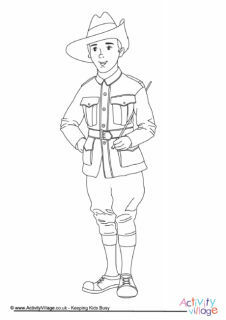 Kids can use this story paper to write the story of the heroic John Simpson and his donkey in their own words, then colour in the picture. Lots more fun donkey activities here, including "learn to draw", colouring pages and printables.